Store-bought marshmallows don't even compare to the airy, delicate, delicious marshmallows that melt away in your mouth when you make them at home. If you have a stand mixer, it's really simple, not to mention that there is an almost limitless number of flavorings and add-ins that you can experiment with. I made these with just a touch of vanilla, but use whatever flavoring you want. Spray down the bowl of your stand mixer and the paddle attachment with cooking spray (you'll thank me later). Add water and gelatin to the bowl of the stand mixer to bloom. Stir sugar and corn syrup together in a medium saucepan over medium heat. Allow the sugar and corn syrup to come to a simmer and simmer over medium heat for 3 - 4 minutes. Turn stand mixer on to a medium speed and drizzle the hot sugar mixture into the bowl. When it looks like the sugar is coming together with the gelatin and the danger of hot sugar splashing out the sides of the bowl has passed, turn the mixer up to high and let it go until white fluffy marshmallow forms (10 + minutes). Dust your pan with powdered sugar and pour marshmallow into pan and smooth out to form a relatively flat service. Dust the top with more powdered sugar and let sit at room temperature for 30 - 60 minutes until set. Cut into cubes and dust with more sugar to take care of any stickiness on the cut edges. Enjoy! 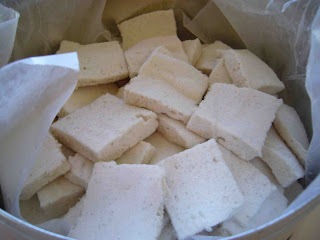 I've been meaning to make marshmallows for ages but didn't realise just how easy it is. I'll definitely give this a go.